University students are frequently asked to assume the role of researcher in order to learn about people. Rarely, however, are students encouraged to work with people to investigate questions that the people themselves identify as important. This is the core of an innovative approach called Participatory Action Research used in several fields, including Anthropology, which combines dialogue with collective analysis and action to bring about positive changes desired by a community group. "As co-developers and co-teachers, Jason, Maria and I were able to model collaboration for students. At the same time, the working relationship among the three of us facilitated a collaborative process between us and the students, as well as among the students themselves." Two graduate students in the Department of Anthropology, Maria Hicks and Jason Miller, collaborated with me to develop and co-teach a new Participatory Action Research (PAR) course. The course matched upper division undergraduates and graduate students with community partners from local activist groups, agencies and institutions who were creating new or ongoing projects. The course gave students the theory and skills associated with PAR to support their efforts as co-researchers and co-evaluators of outcomes with their community partners. The course also provided students opportunities to reflect on their own contributions to the PAR process. The Participatory Action Research class acted as the proverbial pebble thrown into water whose impact ripples outwards. As co-developers and co-teachers, Jason, Maria and I were able to model collaboration for students. At the same time, the working relationship among the three of us facilitated a collaborative process between us and the students, as well as among the students themselves. The course set into motion relationships between students and community members for research projects that were new or ongoing, and the work accomplished by students as co-members of community-based research groups has enabled the community members to build on students' contributions and to move closer to attaining their goals. It is for these reasons PAR is PARticularly Appropriate for Anthropology. Students are reaping the benefits of participating in PAR by realizing their strengths and knowledge. They are also finding new paths to future endeavors and gaining knowledge from the community. For many years I have taught a class entitled Fieldwork Methods in Cultural Anthropology. Students select a field site in the community for the academic quarter and learn about the people and activities of the selected site using the hallmark anthropological methods of participant-observation and interviewing. Students' research eventually narrows to a focus and a search for major and minor themes of cultural principles, values, and behaviors. 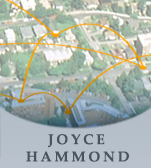 The research culminates in a written ethnography which is shared with people of their field site. Over the years, many students expressed frustration with the short ten-week research period, but from my perspective, an extension of the course into another quarter was not a wise use of instructor classroom hours since students had already been introduced to and had practiced the basic skills of traditional anthropological fieldwork. However, when Participatory Action Research came into view as a viable way to build on students' investigatory skills, as well as the rapport they had established with community people, I saw, at last, how a meaningful new course could be developed. By entering into collaborative research with community partners, not only would students learn a new way to engage in research, but they and their community partners would mutually benefit from the results of working collaboratively toward changes that community members desired. 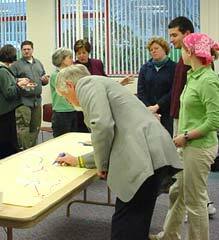 In March, 2003, Jason, Maria and I attended the Society for Applied Anthropology meetings in Portland, Oregon. It was the first SfAA any of us had attended. Panels and workshops about Participatory Action Research caught our attention and proved catalytic for all of us, individually and collectively. We began to talk about a course that could extend students' research skills and knowledge--a course that would take students in an exciting and meaningful new direction with people at their field site. Our collective vision called for a class that would give students an opportunity to learn PAR theory and methods needed for stepping into a co-researcher role with community members. After deciding to launch the course the following Winter Quarter, all three of us pursued individual plans to become more engaged and knowledgeable about Participatory Action Research theories and methodologies. We reasoned that our varied personal experiences with PAR would enrich our work together and strengthen the class. Accordingly, we went our separate ways to work on PAR related projects and reunited in the late summer after engaging in PAR experiences through the University of British Columbia Field School among the St�:l� (Jason), in Peru at the Center for Social Well Being (Maria), and in Ottawa, Ontario, with Mosaic International (Joyce). In August, we began contacting potential community partners in Bellingham with whom students could work both in the Fall and Winter Quarters. We felt that students should work with the same community groups during the fall Fieldwork Methods course and the winter PAR course in order for students to gain a more in-depth understanding of issues and practices of their PAR partners. The cumulative twenty-week period of interaction would also facilitate deeper rapport and trust. In letters and phone calls we described the Participatory Action Research course and outlined what an organization might expect of a student as a team member of a PAR project. We also outlined what we hoped "core stakeholders" of the organization (people who form a core group in the PAR research process as a consequence of their positions and/or interest in a particular research project) would do in the way of mentoring a student and evaluating the student's work. At the beginning of Fall Quarter, those students taking Fieldwork Methods who knew they wanted to continue on to the PAR course selected field sites from a list of organizations which had expressed interest in having students work with them. Throughout the fall, Maria, Jason and I continued to develop plans for the new class by selecting readings, creating a syllabus, staying in touch with community partners, and planning a six-hour Preliminary Workshop to launch students in PAR. As the PAR course began in Winter Quarter, we resolved to remain flexible once the class was underway in order to accommodate student needs and concerns as they arose. Using PAR principles, students joined us in shaping many elements of the course once it began, including working together to make decisions of what to spend more time discussing, practicing, and learning; to prepare evaluation forms for community partners; and to make plans for a culminating community celebration with community partners. Now that the first class of PAR has concluded, Jason, Maria and I are engaged in thinking about ways to improve it for its next offering. Student and community partner evaluations are an important component of this reflective process. The overall purpose of the Participatory Action Research course is to teach students collaborative research skills and to provide them with experience in community action projects. Through the course, each student was linked with a group of community stakeholders who were already engaged in or interested in beginning a PAR project. 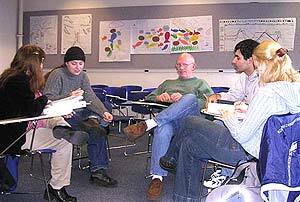 Students' responsibilities included participating in meetings; creating and disseminating meeting notes; engaging in co-research, analysis and summary of findings; making recommendations for further research and actions; and, when possible, providing access to resources, including ones specifically applicable to specific situations. In short, the students' work was part of the process of moving community research and action plans closer to completion. For more course information, see Course Goals and Overview. "A temperature gauge tool that tracked students' emotional responses to their work on a week-by-week basis provided yet another means of eliciting students' feelings and ideas about their research project participation...It was not uncommon for students to be found in pairs and small clusters earnestly discussing their projects not far from the classroom door when class was officially over for the day." Throughout the quarter, students reflected upon and shared their feelings about the PAR process and the progress of the community projects. They were able to express their frustrations and challenges, as well as to share the excitement of working with others in discovering answers to questions important to community members. Strategies and specific activities in the PAR projects did not always match the ideals of collaborative undertakings and varied with individual student partnerships. Even so, all of the students' experiences were incorporated into the class content via periodic written and verbal "check-ins." A temperature gauge tool that tracked students' emotional responses to their work on a week-by-week basis provided yet another means of eliciting students' feelings and ideas about their research and analysis participation. Each student benefited from the lessons learned by other students, and each student received suggestions, critique, and encouragement from other students and the instructors. It was not uncommon for students to be found in pairs and small clusters earnestly discussing their projects not far from the classroom door when class was officially over for the day. Thus, collaboration for this course extended beyond the work I did with Maria and Jason to develop and teach the course, and involved every class member, class session, and every interaction with the community. "The experience of working on a project in conjunction with a local community group allowed students to add many skills to their repertoir of participatory action research strategies." In the community, students honed their skills and capabilities as co-participants in Community-Designed Projects. Students learned many, many real life lessons by collaborating with community partners. For example, students learned what stakeholders considered to be important research questions and what research strategies to employ for the greatest benefit. Each student's lessons emerged organically from the action research process, and students' experiences equipped them with unique perspectives and sensibilities to apply in future endeavors. Many of the students' comments referred to the insights they gained in the process. Students concluded the course by giving presentations to the class and core stakeholders, compiling a portfolio of the community-based project, and drawing upon suggestions from the instructors, classmates, and community partners to craft a final version of their portfolios to give to community partners. To celebrate the collaborative work of students with community partners, the class planned a community celebration of their joint achievements. The experience of working on a project in conjunction with a local community group allowed students to add many skills to their repertoire of participatory action research strategies. Planning and teaching the Participatory Action Research class with two graduate students was a wonderful new experience which gave me the opportunity to grow as a teacher and as a student. Jason and Maria's enthusiasm and excitement about co-creating the course was inspirational and energizing. The best part of creating and teaching the class with Maria and Jason was the experience of working with them as colleagues. Creative, intelligent, and hard-working, they were ideal collaborators. New ideas would emerge whenever we came together. With three backgrounds of PAR experiences, we were able to draw upon more ideas and experiences as we shaped the course. We worked very well together as a team, dividing up some tasks and collectively working on other aspects of the course. Since we all had busy schedules, we would sometimes meet in pairs and, at other times, as a group. Emails and phone-calls kept everything glued together. Time schedules were helpful, but we always built in flexibility as well. Once the course got underway, Jason and I were both in the classroom every class period. Maria, who lived in another city at that point, commuted to join us every other week. Although we always walked into the classroom with a plan of how presenting concepts, facilitating discussions, and teaching skills would be organized and shared among us, the actual flow and sometimes the content would spontaneously evolve during the class period. I was continually delighted with the insightful, encouraging, and professional contributions Maria and Jason made as teachers. As both teachers and students, Jason and Maria served as excellent role models and mentors to the students. Since students enrolled in the class contributed their experiences, ideas, and critiques nearly as much as we three did, at times it felt as if everyone in the classroom was simultaneously a teacher and a student. People who use a Participatory Action Research approach can utilize many strategies for research (See Overview of PAR Tools); all are distinguished by the cooperative nature of the research process. For that reason, strategies that encourage and support any participant to reflect upon and draw from her or his knowledge work well. Many of the research strategies developed by community-based action research approaches were originally developed in rural areas of the Global South where some people have not received much formal education. The creative approaches which emphasize using tools at hand (such as drawing maps on the ground to show resource locations or using pebbles or leaves as markers for research matrices) allow anyone to contribute to the research process. The advantage of using a wide variety of research tools is that the tools have the potential to elicit creative, reflective and empowering thought that accommodates a variety of learning and thinking styles. 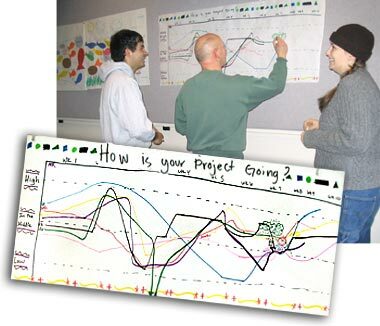 Visual tools, in particular, provide a means for people to display what they know and to show the results of their research and knowledge to others. "The best PAR research supports an interactive component among participants that facilitates group interaction and coherence as part of the process itself." The collaborative aspect of building a knowledge base in relation to a research question is facilitated by a visual display of responses. Community members may be drawn into discussions of individual responses and enter into a dialogue about challenges the community faces, best possible approaches to improving conditions, and possibilities for the future. Appreciative Inquiry: a research strategy that centers on identifying positive behaviors and attitudes that can be enhanced and built upon in addressing concerns, making decisions, and assessing actions. Focus Groups: a research approach that allows a group of stakeholders to respond to a set of questions which are important to them. Focus groups in PAR are interactive and are often faciliated by community researchers. The best PAR research supports an interactive component among participants that facilitates group interaction and coherence as part of the process itself. Students learned about Participatory Action Research tools during class time and often practiced them in the classroom before suggesting their use to the community partners. Practice exercises were context specific. Questions posed and responses given addressed students' own knowledge of how they were experiencing the lessons, the classroom, and projects with their community teams. Students learned to analyze the results of PAR methodologies, looking for overarching and minor themes to emerge. personal growth was their own. As Jason, Maria, and I taught the class, the useful metaphor of student as midwife helped us to explain to students that the projects they were working on were not their own despite the fact that they helped to guide the project's emergence or continuation. Students' roles were to assist, to seek information, to make observations, and to lend their energies to making the PAR processes of their community partners more viable. Just as a midwife may justifiably take pride in the crucial assistance and advocacy she/he provides birthing parents, she/he is always aware that the baby is not her/his own. This became humorous as the short ten-week quarter often left students remarking they felt as if they were having the baby. We also felt the midwife metaphor was apt for our role as the co-teachers of the course. The students' knowledge and personal growth was their own. As teachers, we facilitated and supported their learning. As the midwives, it was gratifying for us to see students recognize and fully own their own knowledge based on their learning and experiences. "I'm still kind of surprised at how much I've learned from my community partners; how a business is run, and how you can organize a project, plan it out, and make it look perfect on paper�and then you go to start it, and it just doesn't work like that! I feel like I probably would have just panicked if something like that happened to me in a job situation and now I know how to deal with that; I know that it's normal and it's OK. That was invaluable knowledge that I could not have gained from classroom experiences alone." "In the school system, you have an idea for a paper, you write your paper, you turn it in, and you can get a good grade. That doesn't happen in the real world and I really appreciate that. I really needed that wake up call because I'm graduating this quarter and going out into the real world. I really needed that, and I didn't even know it. I feel so much more prepared now to go out and work." In November of 2003, even before we offered Participatory Action Research as a class, Jason, Maria and I, along with a few other students from WWU and elsewhere, joined in an Invited Roundtable entitled Teaching Peace: Teaching Anthropological Methods to Serve Others at the American Anthropological Association meetings in Chicago, Illinois. The roundtable format was congruent with PAR since it allowed discussants and attendees to join into discussion as equals. Everyone was an expert, contributing her or his insights, concerns, and questions about the issues raised. The flexible agenda created room for all voices to be heard. In late March, 2004, Maria and Joyce participated in a panel entitled Participatory Action Research: Discovering Paths to Social Transformation at the Society for Applied Anthropology meetings in Dallas, Texas. Maria's paper (Is There a Role for the Researcher in PAR?) included a discussion of her experiences with teaching the PAR class. Joyce served as a discussant for all the papers of the panel. Jason's paper entitled University Researchers and Community Laboratories: Human Subjects vs. Community Partners was also included as part of a backdrop of ideas to guide a roundtable discussion that took place at the conference. In November of this year, Joyce, Maria, Jason, and Lana Regat, a member of the PAR class, plan to present posters related to the PAR class at the American Anthropological Association's annual meeting. Maria, Jason, and Joyce are currently discussing a plan to present information about teaching PAR in the upcoming meetings for the Society for Applied Anthropology in Santa Fe in 2005. As part of Western Washington University's Scholars' Week held each spring, the graduate student members of the PAR class displayed a poster on their PAR projects in the community. 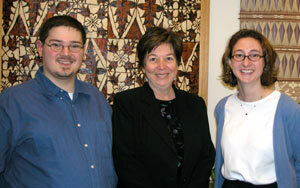 Maria and Jason participated in a Scholars' Week panel on anthropologists as activists. Following the conclusion of the PAR class, some of the students continued working with their community members on their projects. In at least one case, the PAR work opened some doors to job employment with a participating community agency. In the summer of 2004 Maria will return to Peru to an internship with the Center for Social Wellbeing where she will assist with two three-week field schools on PAR methodologies. Next winter, Rowenn Kalman, a member of the first PAR class, will join Dr. Hammond as a co-teacher of the second offering of the course. "What made Lana's involvement with Whatcom Center for Early Learning unique was that she walked in with an anthropologist's perspective, which she later shared with us, via her final ethnography. [Our] staff, board members and parents of children in the program all made comments about feeling seen by Lana, as she captured the culture of our center. We appreciated that she acknowledged and described the multilayered support that enables staff to support parents as they build a new dream for their child." "Lana's work on our community survey last quarter was grounded in the knowledge she already had of [our center] and has resulted in a higher degree of awareness among school district personnel about the need for increased funds for early intervention services in our county." Rework the initial contact process to make it more effective and efficient. Make a phone call to organizations first to determine to whom a letter should be sent about the opportunity to work with PAR students (rather than sending a letter out to an unspecified person within the organization). Work more closely with community partner core stakeholders prior to the class to identify questions and concerns that they might have for working with students in projects; create an orientation session for partners to clarify expectations. Become more familiar with the language and terms used by community partners so that a better "translation" process can occur in the classroom when introducing students to community terminology. Invite community partners to class meetings to share insights and challenges they have in their work in the community. Spend more time in class early in the quarter discussing communities�how they form, define themselves, work and live together. Teach an in-depth exploration of Appreciative Inquiry as a research strategy earlier in the term; students found this tool to be one of the most useful and wished that they learned about it in greater depth earlier. Have students co-create a task timeline with their community core stakeholders before the beginning of the PAR term so that everyone can schedule meeting times and have more accurate expectations of when certain tasks will be completed. Distribute evaluation forms to both core stakeholders and students early in the quarter that allow everyone to know what objectives and criteria the stakeholders will use to assess students' engagement in the PAR project. Help students to better understand where they step into the spiral of the iterative PAR cycle�whether that is at the beginning of a PAR project, in the midst of one, or near the completion of a project�so that they may better understand their role during their participation. Allow more time for students to discuss their PAR projects in class. Check in with core stakeholders on an even more frequent basis to support their efforts to guide and work with student PAR researchers. Share students' remarks about advice for next year's students with students during the first class meeting. With the completion of the 2004 PAR course and our thoughts for more effective actions for the future, Jason, Maria, and I feel that we have completed a full, first circle in what we hope will be a continuing set of interrelated PAR course cycles. It is our hope that future WWU Anthropology students and their community partners will benefit from our collaborative PAR work together.